There are a lot of reasons why Capetonians avoid the V&A Waterfront. High-priced restaurants that deliver little more than a tourist-trap experience is one of them. I sat at a reputed steakhouse the other day and watched somebody send back two plates of brown beef Carpaccio before a freshly sliced red version finally satisfied. After taking up an invitation to join a group for lunch at new Mondiall Kitchen & Bar, I know there is hope on the culinary harbour front. Chef Peter Tempelhoff has plenty of experience and accolades behind his name. As Executive Chef of The Collection by Liz McGrath hotels, he’s used to moving from one restaurant to the next and entrusting the hands-on work to a good team. 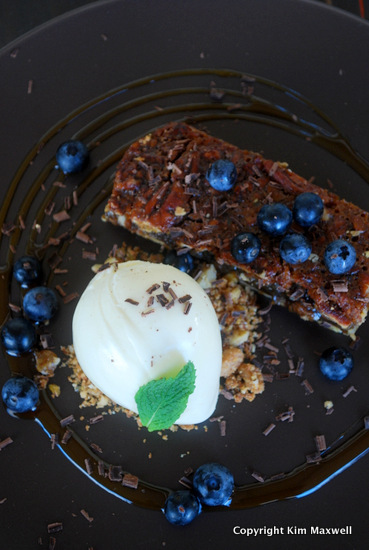 At Mondiall he’s in partnership with Patrick Symington, who put lounge venue Café Dharma and Asoka on the Cape Town map. They both bid separately for this restaurant space, and landed up as partners. I once waitressed at The Green Dolphin, where Mondiall now trades. Home for a few months after a backpacking stint in Europe, I was saving for my next working trip to Asia. It was the place to earn good tips from steak-lovers and seafood fans that booked dinner tables to hear live jazz bands in a dark, upmarket clubby sort of space. It’s all very different now. The Table Mountain views through glass window panels are still awesome, but the new Mondiall interior has been livened and lightened by stylish furniture in wood and beige tones against backdrops of exposed brick, antiqued mirrors and trendy vodka bottles. The open pass adds kitchen energy and an upper level uses old wooden shutters and hanging elements cleverly. A designer has spent money here, but hasn’t stripped the place of personality. Tables are made from recycled wood and you get the feeling somebody also spent a long time selecting crockery, serving boards and glasses too. Oliver Cattermole is in the kitchen daily, but Peter’s input is visible in the food style and spiffy presentation. Initially planning a classic brasserie, Peter’s concept evolved into incorporating favourite dishes from his travels (he grew up in both Canada and South Africa). 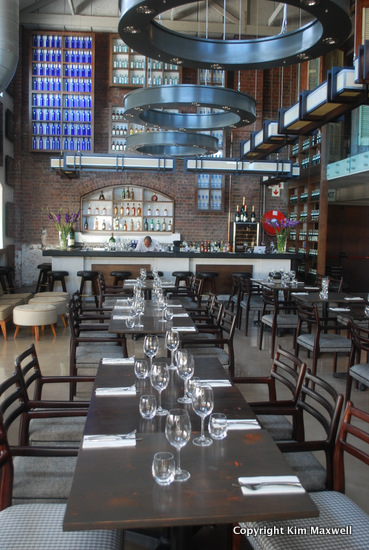 Mondial translates in Italian and French as worldwide, hence the eclectic dishes. ‘The menu looks a bit of a Jack of all trades, but it’s how people eat,’ explains Peter, referring to Italian, Asian, French, South African and Mexican dishes. There’s a lot of choice, but also dishes you want to eat. Having a menu indicate dates and places where each dish supposedly originated, also gets a table talking. What’s good? This just-opened restaurant is still nailing the last planks of wood down, so the kitchen is also ironing out kinks. But West Coast oysters (R20 each) are served the French way on ice, with finely diced shallot vinegar and a squeeze of lemon. 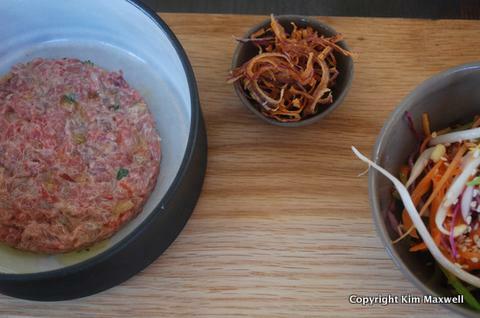 Steak tartare (R87) – circa 1921, Paris – sees finely chopped sirloin already assembled, and is served Asian-style with a red cabbage and sesame oil coleslaw, plus crispy onion bits for crunch. Tender and tasty, Buffalo wings (R68) – circa 1964, Buffalo – are cooked with ‘Memphis dust’, celery slices and a thick blue cheese sauce. A Caesar and Waldorf salad under the ‘soup and salad’ section also caught my eye. I’ll be tempted to order the potato and Parmesan gnocchi (R76 or R125) next time – it looks vibrant and delicious on a plate, with its mix of sautéed woodland mushrooms, semi-dried tomatoes, rocket pesto and taleggio. 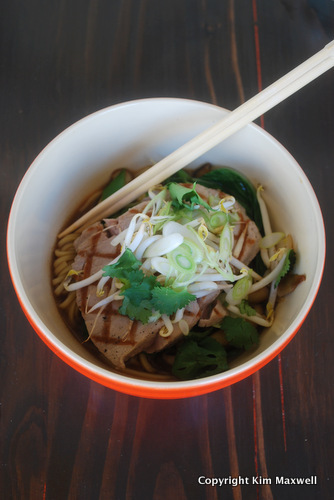 Instead I tried the fish of the day (R135) – grilled yellow-fin tuna on a richly fragrant bowl of ramen noodles, meaty Asian mushrooms and greens, ladled with comforting lightly spiced Chinese master stock. A rookie mistake was opting for the recommended medium-rare tuna as the sliced piece that arrived was overcooked, but another diner at our table requested seared pink tuna – as I would’ve preferred – and got it. 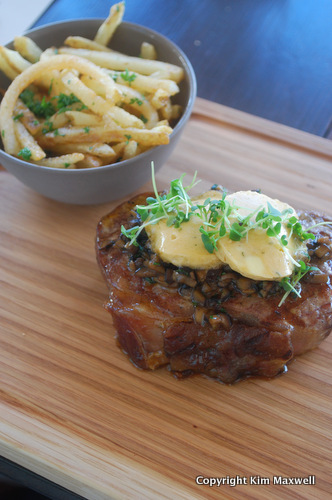 You can order a cheeseburger and fries made from locally reared Wagyu beef too, with trimmings and umami sauce for R120. I’ll probably be back to tackle the grilled sirloin Café de Paris (R155) – circa 1932, Geneva – it comes topped with the signature butter and a novel mushroom ragout, plus a side bowl of thin-cut fries. But let’s skip straight to the high point of my Mondiall meal. Forget the apple tart tatin, Cape Malva or Mondiall chocolate sundae for dessert. If you want to be impressed by a chewy base with sweet intensity and just the right amount of springiness under the nuts, order the maple and pecan pie (R68). It’s partnered with a scoop of milk ice-cream, blueberries and sticky maple-syrup-reduced-with-Bourbon sauce. Like most Mondiall desserts it’s priced on the high side, but here you’re paying for real Vermont maple syrup that is so worth it. As is often the case, this restaurant is still sorting out a few staff and kitchen kinks – there was some inconsistency of ingredients and they were operating without a permanent gas supply the day we ate – but I’m fairly certain they’ll find their feet. The V&A Waterfront is one of Cape Town’s most popular destinations and there is way too much mediocre eating to be found there. It’s too good an opportunity to waste. Impossible to get through on your landline 0214183003 please get back to us. Require booking for 4 for eight o'clock. Sat, 28 Dec please. Will defintely not be going bcak there! !